Newton Rigg is part of Askham Bryan College which specialises in providing land-based further and higher education. The overall winners of the The Great Farm Challenge 2019 in the North West were Holly Potter, Ellie Stamper and Ellie Colling after a close run contest. 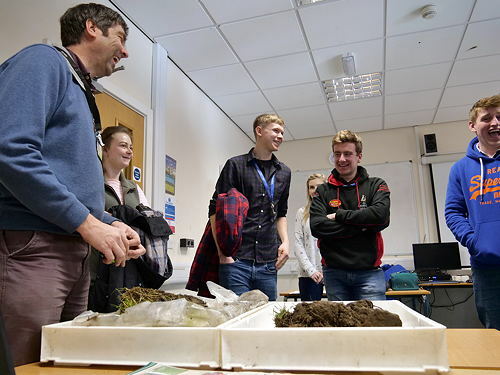 Organised by Natural England in partnership with The Environment Agency, Defra and United Utilities, five teams of students worked on projects to assess and address the impact of different farm practices on the natural environment and farm business. Their projects were developed into plans and presented to a panel of judges with representatives from the Environment Agency, United Utilities and Eden Rivers Trust. The Newton Rigg College students impressed the judges with their plans for managing a successful farm by focussing on minimising run-off from pesticides, nutrients and suspended solids such as sediment and algae which can be problematic for aquatic life, whilst also looking at ways to improve air quality and using water wisely. “The students all acquitted themselves well, with the winning team demonstrating the greatest depth of knowledge and understanding of the subjects covered. The Great Farm Challenge is a joint partnership, led by Natural England, Defra, Environment Agency and regional water companies Severn Trent, Anglian Water and United Utilities. As a collective, the partnership continues to nurture the next generation of farmers and encourage strategic solutions for them to carry throughout their careers. This year marks the 8th Great Farm Challenge. Since its inception, Natural England says that over 1,170 students and land managers have got involved in improving water and air quality through best farming practice. - 2014 the farm's dairy unit and new agriculture centre, The Frank Parkinson Building, were officially opened. Newton Rigg is the oldest college providing land-based education in the country. It first opened its doors to students in 1896.